I discovered a gem of southern Spanish Tapas right in the heart of Mallorca. Situated a few minutes walk from Plaza de Espana on Carrer Faust Morell 5, this is a place worth visiting time and time again. I had rented an apartment literally just around the corner, and went into the restaurant to have a cortado. Although no one spoke English, the warmth and hospitality of the staff was evident. A traditional ultra clean Spanish restaurant interior welcomes as you enter the door. One of the nice things about traditional cafes and restaurants, is that it becomes a ‘local’ place and regulars (like me) are made. I met some absolutely charming people. some who could not speak English, but still welcomed me and some who spoke English and took the opportunity to practice on me. One of the people who came into the restaurant, a well known local artist, Yolanda Adrover. She introduced me to different Tapas and local life and customs and we talked and laughed many a night. A wonderful person and very creative and hospitable. Her work is available in book form, based on her exhibitions. The food at el Rocio is prepared fresh from the raw natural ingedients. I laughed one day when someone brought in a can of home prepared asparagus for me to try, and the restaurant did not possess a can opener. My favourite Spanish food is Jamon. El Rocio has some of the finest Iberico just hanging from racks waiting to be used or sold to people buying a whole leg for home. I partook of many slices of the jamon..
Then there is the amazing fresh tapas! And this is the man that makes all the magic happen. “Senor Francisco”… known as Paco. Very quiet and unflappable and generous. Notenom was opened in 2012 by the Miguel Moya and wife Magdalena team, with the purpose of creating a Fusion between the fabulous Spanish cuisine and the exotic flavours of Asia. Notenom is the place to go for a truly international blend of gastronomic delight. Already a firm TripAdvisor listed restaurant in the top 20 of Mallorcas fine dining eateries. Miguels kitchen uses only daily purchased fresh produce. From the fish to the meat to the vegetables, everything is prepared in the kitchen without compromise from the raw materials and turned into a taste sensation. Notenom has an extensive and distinguished wine cellar to offer the discerning diner. The after dinner selection of innovative desserts and a choice of the finest coffees has to be tasted to be believed. Notenom has an extensive lunch and dinner menu at the most reasonable prices in Palma, and also offers their extensive experience in group catering for internal or external events. Without a word of a lie, had Pinocchio lived in Spain he would have eaten Piononos. Religiously so. But it was not named after the boy with the nose that extends when he fibs. That story was just a myth put about by some liars – relatives of Pinocchio no doubt. For piononos are small pastries named after a 19th century Pope called Pio Nono. They are shaped liked papal clothing. In my experience it will not take you long to eat one. Bite sized pastries that will leave you wanting more. And more! They hail from the town of Santa Fe, now a sprawling town located within earshot of the airport at Granada. Santa Fe is also famous for being the place where the last Nasrid King of Spain, Boabdil, handed over the keys for the city of Granada to the conquering Christians. This notable moment in Spanish history is commemorated, rather incongruously, by a plaque at a petrol station! Back to a different kind of fuel. The fast food that are piononos. Speedy in the sense that they are consumed so quickly. It is a snack of two halves. Firstly a cylinder shaped roll of pastry with syrup that ensures the pionono has a sweet taste. Then it is topped off with toasted cream. They are made with egg whites, sugar, milk, lemon rind, cinnamon and – my personal favourite ingredient – rum. You will find variations on that theme in the town of Santa Fe where certain cooks will claim to have their own secret recipe. In the 19th century it was three widowed sisters from the bakery “La Blanquita” who rediscovered the original recipe and decided to name it “Papa Pío Noveno”, giving it a Papal headgear, mitre like shape. The bakers of Santa Fe are rightly very proud of their creations. In the big city of Granada itself you will find certain shops and cafes specialise in the pionono. For example, Rey Fernando on the historic street of Reyes Catolicos is a favourite cafe with many locals, as is La Isla on Acera del Darro, just beside the Hotel Carmen. You can buy bigger versions of the pionono, roughly the size of a small apple, or the smaller model. You can have them nicely wrapped in a box and take away to savour at home. Mine rarely last that long. But Granadinos would take them home for the traditional “merienda” or high tea at around 5pm. This is when such Spanish snacks are most often consumed alongside the almost mandatory cup of coffee. When in Rome, do as the Romans do. And when in Spain, eat as the locals do. And when Rome and Spain meet, you have the pionono. Food fit for a Pope. Or a boy made of wood who cannot help but tell lies. Try mixing 25% Olive oil with the light oil if you want a stronger taste. Be careful.. adding too much Olive Oil can spoil the taste. This is one of my favourite all time Spanish additions to salads and potatoes and as a dip. 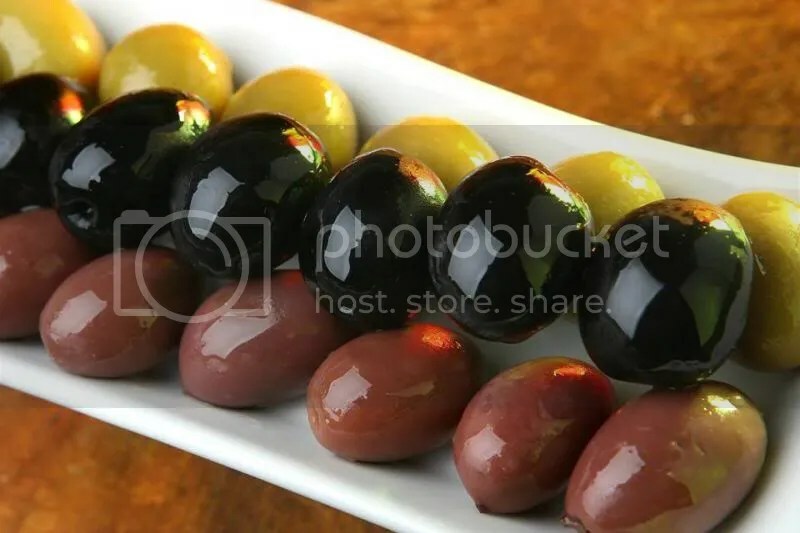 A very Spanish presentation reminds us about the recommended daily amount is seven olives.Do not forget your seven olives from Spain! a sprig of cilantro and salt. Place the oilive oil over low heat with the chilli. 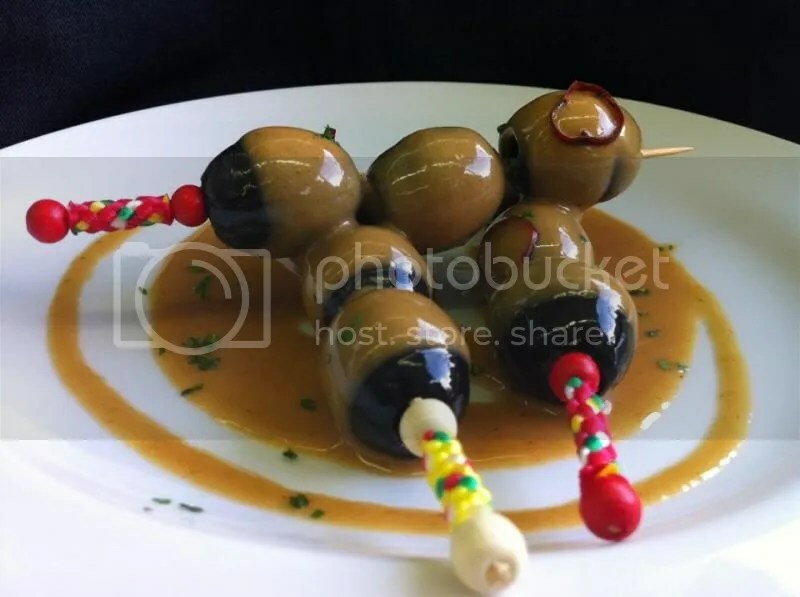 Dip the olives into this olive, and put them on skewers.Prepare a peanut purée with oil and salt. Add honey and white vinegar to the puree and mix well. Chop the cilantro. Add the cilantro to the peanut sauce and the olives.